If you hunch or slouch, then you probably have Rounded shoulders! What is the correct shoulder position? Internal rotation of the humerus. Rounded shoulders are part of a bigger problem… and that is bad posture. Your posture becomes the shape you decide to position your body throughout the day. I am willing to bet that you have Rounded shoulders in most (…if not all) of these positions! … Am I right? These hunched postures you adopt throughout the day disrupts the normal balance of muscular activity that is responsible for maintaining your ideal shoulder position. What muscles cause Rounded shoulders? In Rounded shoulders, there is an imbalance of tension between the muscles that pull that shoulders forwards and the muscles that pull the shoulders backwards. Think about it this way: There’s a tug-of-war battle between the muscles at the front and back of the shoulders… And the front muscles are dominating! These muscles are PULLING the shoulders into the forward position. The following muscles ARE NOT pulling the shoulder backwards into a neutral position. Yes, I know… It’s pretty much the whole back! Stand up in normal posture. Have a quick glance at your hands. … Which way are your palms facing? Your palms are facing behind you. Lie down with your back flat against the floor and arms by your side. Do the back of your shoulders naturally rest on the floor? Or do they sit in a forward position? The back of the shoulders do not come in contact with the floor. Get someone to take a photo of your posture in side profile. Draw a vertical line along the mid line of your torso. Draw a vertical line along the mid line of your shoulder. The shoulder line is in front of the torso line. Dedicate 20-30 minutes doing these exercises. Don’t rush through it. It’ll take time fix your shoulders… and that’s perfectly fine! Commit to these exercises for a frequency of 2/week. Note: These exercises are designed to be gentle and should not aggravate any symptoms. If any doubts, please feel free to join me on the PostureDirect Facebook. Tight muscles will lock the shoulders in the forward position. It is important that they are firstly released to enable the shoulders to be re-positioned correctly. Place the massage ball directly under these muscles. Apply an appropriate amount of body weight onto the ball. If it’s tight…. it’s going to be tender! Perform a gentle circular motion over these areas. Ease off the pressure if you are tensing up. Make sure you cover the entire muscle. Place the foam roller directly under these muscles. Note: Stretching is all about a game of angles. If you can’t feel a stretch, then you probably aren’t doing a whole lot of stretching. Move around the stretch. Pull your shoulders back and down. Aim to feel a stretch in the front part of your shoulder/chest region. Keep your shoulder blades squeezed together. Keep your elbows in. Don’t let them flare out. Do not let your shoulder protract forwards. You should feel a stretch at the front of your shoulders. Place your palm (facing down) onto a wall. Keep your arm completely straight. Tilt your head to the opposite side. You may feel the stretch in the fingers, forearm, bicep and/or side neck region. Using your hand, pull your head further into the tilt. Aim to feel a stretch on the side of your neck. Gentle pull your should blades together. Hold onto a stick with both hands. Lock your elbow into the sides of your body. Push your hand out to the side. Apply an appropriate amount of body weight onto the foam roller. … but do not let your lower rib cage flare outwards. Aim to feel the foam roller pushing into your back. If you have completed all of the above exercises, your shoulders should be feeling much more flexible. Having the flexibility in your shoulder merely allows the potential to have them in a better position. You will need to strengthen the muscles to keep your shoulders in the correct posture. All of the exercises below will require you to maintain this contraction throughout. Learn this movement FIRST! Maintain wide and long shoulders. FEEL the contraction of the mid to lower portion between the shoulder blades. Aim to relax every other muscle. Do NOT over squeeze your shoulder blades together! Perform Scapula Retraction/Depression/Posterior tilt whilst pulling elbows backwards. Feel the contraction between the shoulder blades. Aim to feel the muscular contraction between your shoulder blades. Support your chest on a stool. Perform Scapula Retraction/Depression/Posterior tilt throughout the exercise. Draw small circles in a backwards direction. Transition to the arms over head position. Remember to perform Scapula Retraction/Depression/Posterior tilt throughout all movements. Keep your back and arms pulled backwards as to remain in contact with the wall at all times. Once you have achieved a more neutral shoulder position, the next step is to eccentrically strengthen your chest muscles. Eccentric training is where you strengthen the muscle as it is lengthening. This will help open up your chest muscles even more! Assume a push up position against a door frame. Lean your weight into your hands. Keep your shoulders pulled back and down throughout the exercise. Slowly lower your chest down towards the wall as you bend your elbows. Do not let your elbows flare outwards. Aim to go as deep as possible so that you feel a deep stretch in the chest muscles. Restart and repeat 10 times. Taping your shoulder in the correct position will help remind you to maintain your good posture. Gently pull your shoulders back and down into a neutral position. Depending on your skin irritability, you can leave the tape on for up to ~2 days. Wearing a brace to prevent your shoulders from rolling forward can be helpful in this initial stages of fixing your posture. My only warning is that you do NOT become reliant on it! Now that you have completed all of the exercises, let me teach you how to put your shoulders in the correct shoulder position. This is what you should aim to hold throughout the day! Slightly bring your arms backwards. Turn your palms upwards so that your elbow creases are pointing towards the sky. Take note of your shoulder position. Keep this position! And gently lower your arms by your side. Hi, really helpful article! My question is what do I do if one (my right)shoulder is wayyy more rounded and forward than the other? Both are really bad, but one is so bad that it might be 6 inches more than the other. In fact it’s so bad that my neck is almost horizontal to the ground and I hyperextend my lumbar spine just so I don’t look like a hunchback. I also purposely twist my torso to the right so my neck and shoulders seem even but my torso is twisted and this causes a lot of strain on other parts of the body. Because of my compensations my physical therapist for a year never noticed this but worked on other superficial tightness that was the result of my twisting and lack of thoracic mobility. I got this bad because I sat on a recliner which made me very hunched for about 1 year 14 hours daily after an accident. Any advice? Thanks! In regards to one shoulder being more forward than the other, I have a blog post on this exact topic coming out soon. Stay tuned for that. If your upper back is quite hunched, have a look at this post as well: Hunch back posture. hi Mark and thanks for your articles! It is true that you will need to strengthen those muscles that prevent gravity from pulling your shoulders forward, however, you never really want to force any positions/postures that the body is not ready to adopt. Otherwise – you’ll end up likely causing some other issue. Although engaging these muscles is apart of addressing your rounded shoulders, it is only 1 piece of the puzzle. Hey Mark,thanks for such a helpful article but I want to know that can I continue my bench press because I have rounded shoulders and have read it that bench press will make it more worse and is chest expander a good way to get rounded shoulders in shape? It is fine to continue with your benching. Just make sure that you balance it out with back exercises. Hi Mark! Thank you so much for this! Ive been having pain in the right side of my back for 2 years and have been trying to find the source. I’ve also recently been having tightness and pain in my neck and upper traps too. I really think rounded shoulders/posture is the cause. I’ve done your whole routine 3 times now and have been activating muscles I didn’t even know existed! My posture is definitely improving already. The issue I’ve been having is my upper traps and neck muscles are still very active and are causing very uncomfortable tight feeling. It gets worse the better my posture gets. I’m really trying to massage and relax these muscles but they remain super tight. Am I potentially doing something wrong or if I keep doing the exercises will this work itself out? You might be using those upper trap muscles to force your shoulders back. If you can’t relax them, you might need to focus on stretches and releases first. Keep in mind, you don’t want to squeeze your shoulders back together to an extent where it makes all other muscles tense. Keep it relaxed and natural as possible. Can you please let me know what size massage ball you are using in the chest release picture you have posted and where I can purchase one? Thank you. I use a Lacrosse massage ball in most situations. The specific one that I am using in the chest release is called the SuperNova by mobilitywod. Hey Mark. I just read your article on forward shoulders. Really liking it and i will definitely follow through it to correct my issues. My question is, is it common to have issues with engaging the chest on the forward rotated side? My pecs on this side are also smaller and more saggy. Will i be able to correct this, when my shoukder is better? Or do i have to work on the size and feeling separately? One possible reason is that you aren’t allowing a full stretch of the chest before you engage it (eg. during a push up). This can cause issues with strength, size etc. If you can return the forward shoulder to a more neutral position and start loading the chest equally, this should help even up the size. Thank you so so much for your website. I have only been doing your rotated hip exercises for three days and I think its already helping! Do you have any advice for someone with uneven shoulders? My left shoulder is far too high, and my right is low and curves forward in front of my body. When I hold my right arm in the correct position, I can feel strain in the soft tissue between my elbow and shoulder joint, and I get a bruise where my ligament joins my elbow. Are they any exercises I can do to help my shoulders? Great to hear the exercises are helping with your Rotated pelvis. I have a blog post on Uneven shoulders coming out very soon. Have you released this blog post yet? I’m curious to read it as I have uneven shoulders and would like to fix them now because I’m worried about any potential problems this will cause me in the future. Thanks! I’m glad to have stumbled on your site and look forward to focussing to follow and help sort my posture and shoulders. Not sure if it’s ever been asked, but is there any specific advice you can give for athletes, specifically running? My main hobby is long distance running (usually with or without a small pack) so wanted to see if there are specific exercises pre/during/post or just to focus and take care of posture? Intrigued for any pointers. You can still do the same exercises pre and post running if you wanted. If you were short on time, I would just do something like the wall angel exercise to “wake up” those muscles first. As you start to fatigue during your run, it is common for the shoulders to start to roll forward. This is when you need to be more mindful and lightly engage those shoulder blade muscles. 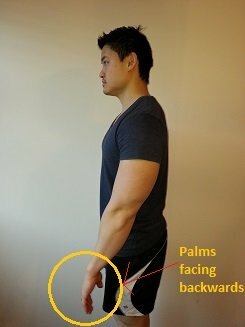 I’ve just began to try and fix my posture now and I have some questions. I used to slouch all the time in school and have begun sitting properly and standing straight. This means that I have a dowagers hump(which i am doing the exercises for) and have rounded shoulders. I’m just wondering if rounded shoulders affect the scapula? Because whenever I bring my shoulders back I notice that my shoulder blades stick out at the back. One shoulder blade sticks out more so then the other. Is this due to my rounded shoulders? And can it be fixed if I continue with these exercises? Or could it be something else? Awesome to hear that you have started to work on your posture! Good thing I have a full blog post on this! Check it out: How to fix a Winged scapula. Hey, before anything I would like to thank you for this ! I have a question : I have rounded shoulders and “winging scapula”, will those stretching et strengthening exercises also help me with my scapula or I should add some more specific ones to my routine ? For winging of the scapula, you will likely need to focus on the serratus anterior. How to fix your Winged scapula. My right shoulder seems to be more rounded than my left shoulder, as well the right shoulder has more mobility. But my left shoulder seems perfectly normal. I’ve also have imbalanced traps. My posture is fine and when ever i look in the mirror and when i put both my hand on my hips, the right shoulder pulls forward as the left seems fine. I am working a new blog post the cover uneven shoulders. It should be out soon! Make sure you follow me on Facebook so that you know when I post it. In the meanwhile, check to see if your torso is rotated to one side. You can get an idea of how your torso is rotated by comparing the left/right side at the front of your rib cage. If you are rotated, it will automatically push one shoulder more forwards. This is the most complete routine I have found to fix the rounded shoulders however I believe it would be too long to do fully for most people. If you had to condense the routine in 3-4 exercises, which ones do you think these would be? The best thing to do is try out the complete routine for a week or so, and see what exercises your body responds to the best. From here – you can select the exercises that specifically help you out the most. It feels like the strengthening exercises are very hard to do right, possibly i’m not doing the Scapula Retraction/Depression/Posterior tilt part right. Is there any video resources or other material you can recommend to give me a better idea? I don’t have any videos yet! But will need to get some up soon for you to see the exercise. Hey Mark, i’ve stumbled on your site while trying to find out how to get rid of rounded shoulders. I’ve had rounded shoulders as well as forward neck postur, dowagers hump it seems throughout my wholelife and even my dad has it. I’ve always been use to it and it hasn’t really caused me problems however i recently turned 30 and i’ve felt that the past year i’ve been getting more severe back, shoulder and neck pain. Your site has given me inspiration and I will try these exercises every day and see how it goes. 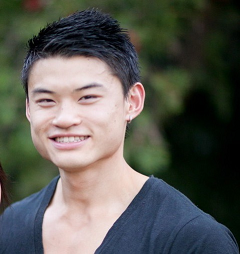 I’m a 28 y/o M and not only do I have rounded shoulders, I also have a forward head and my clavical is not horozontal to the floor, giving me a v shape and making me look like I have hunched shoulders and small neck. I’m a medical student and so I spend most of my time at a desk with a book or on the computer. What weight exercises and workouts at the gym should I focus on to help correct these? – Shoulder retractions/shrugs in prone whilst on an incline angle. Thank you for your article. I Just have found a pain in my shoulder for one month. I had the neck spine MRI, which was normal. I went to physiotherapy where the doctor after the physical check-up, found that I had rounded shoulder problem. I’m practicing your exercises. Just a question? I recently started bodybuilding gym? what’s your advice for me? shall I go with the gym too along with all these exercises you have pointed out? Thank you and looking forward to hearing your response? You can do both gym exercises along side the exercises for your rounded shoulders. Hey Mark, thank you so much for the fantastic resource. Since I see you are responding to questions have two things on my mind. I have some minor discomfort in upper/lower back, but the most noticeable and worrying symptom is a tingling sensation under the left shoulder blade. Just trying to self-analyse my posture, the thing that stands out most is rounded shoulders. 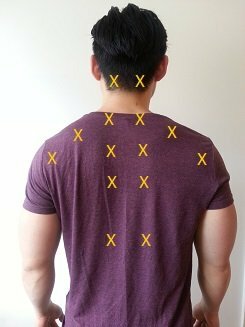 Is it likely that tingling under the shoulder blade is related to having rounded shoulders? Also, not sure if this is your area at all, but I have been to an orthopedist who took an X-ray of my spine/back, but he did not look at it (he said I should bring it if I needed to come back.). Not sure if this is your area at all, but if it is, if you are able to take a glance and see if anything stands out as a problem that would be wonderful. Rounded shoulders may involve lateral glide of the scapula bone. This would mean the scapula is sitting too far too the sides of your rib cage. This can cause elongation of the nerves between the spine and shoulder blade which can result in tingling sensation around the shoulder blade region. Fixing your rounded shoulders may help with this problem. Excellent information & relevant photos to go a long with it. Well done! My question is, I was recently found (CT arthrogram w/Contrast) to have a labrum tear: “Labrum: There is a tear identified across the entirety of the posterior labrum. Tiny para labral cysts noted immediately posterior to the tear.” I am a strength athlete (powerlifting/strongman) and am trying to avoid going the surgery route and subsequent 6+ month rehab. I have stopped all pressing movements and drastically decreased the weight I do for other upper body movements. My posture is junk and will be implementing some of your suggestions above, anything else you may offer for rehab work? Thank you! – Regain your control and strength in your vulnerable positions. Those are some general points to start you off. For more specific exercises, you might be best to get an assessment to see where you need to prioritise. Hey, Mark. I’m a 53 y/o man, and I’ve managed to stay thin and athletically active. However, my upper vertebrae (C-4- C7?) stick way out. It’s a Dowager’s Hump without any fatty tissue, just my spine. Can any of these exercises actually cause my vertebrae to sink back in (for want of the technical term) to form a more graceful, natural spinal curve? If your joints in the C4-7 are not fused together, then it is possible for you to improve the alignment. In conjunction to doing exercises for your Rounded shoulders, I would also recommend doing the exercises for the Dowager’s hump. This seems to be working extremely well! I lift a lot of weights and have always found it difficult to engage my chest, I’m assuming this is because of my rounded shoulders and inability to pin them back when working out. If I did these everyday, how long would it take to begin seeing some solid results? Also, I still feel my lower back is exceptionally tight, as I have an anterior pelvic tilt. I find it difficult to engage my abs during ab workouts and feel pain in my lower back. Any advice? You should see some results pretty much after the first session. However- in terms of fully correcting it, that really varies from person to person. How to fix anterior pelvic tilt. Have a read of that and see how you go with it. Hi Mark, Andrew here, I wrote you a message on Messenger! Please read it. PS you have helped me with my pain, thank you. Glad to hear that your pain is better. I can’t seem to see your message on Facebook though. My right shoulder gets lengthy than left. Filling uneasiness due to this but no pain. Due to this my right hip bones also get wide. Please suggest what to do… really in trouble..
Hi, i usually tend to sleep on my sides and recently began to try sleeping on my back. 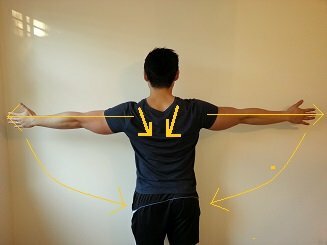 Does that help in any way with rounded shoulders and back posture in general? Yes – side sleeping is what I refer to as Horizontal Slouching. If you get the average 6-8 hours a sleep a night, that means you are technically in a slouched position all that time. Sleeping posture is a bit tricky. Once you are asleep, there’s not too much you can do to ensure that you stay in the one position. If you can’t sleep on your back, you will need to make sure that your neck and upper arm are well supported with pillows. Try to keep your chin ever so slightly towards your upper chest. Keep the back of your neck as elongated as possible. Maintain neutral spine in the neck. What a great post you have here! My question is over the past year I have been experiencing light but noticable familial “no no tremers” and am 61 years old. Could the shoulder roll posture be causing contributing to this or have you ever seen this condition with stiff neck forward shoulder roll? I’ve tried a back posture correction support the last couple of weeks and it has helped a lot but I know it’s not the fix. Great work appreciate your comments and video will start implementing it all makes so much sense addressing the stretch and strengthening muscles. I am not sure what you mean by “nono tremors”? Hi mark! I wonder if it is good to train at the same time as I am doing those correction exercises. I am a soccer player and I do a full body workout when i go to gym for an example dumbbell press, dumbbell row, single leg deadlift and more. Or should I stop until I have a good posture again? It is completely fine to combine the 2.
i want to keep fix all my problems in one routine of 30 minutes a day max or preferably 10 minutes 2 or 3 times a day. I have scoliosis, rounded shoulders, forward head posture and maybe hunchback posture. It is hard to answer this without assessing you. If you are unsure, it is best to see a health professional who can help you combine exercises together. That being said, these blog posts will offer almost everything that you need to know to fix your postural issues. The best way is to do all of the exercises to begin with, stick to the ones that benefits you the most , take out whatever doesn’t seem to make a difference, and go from there. First off thank you so much for providing such an amazing resource online to help people. 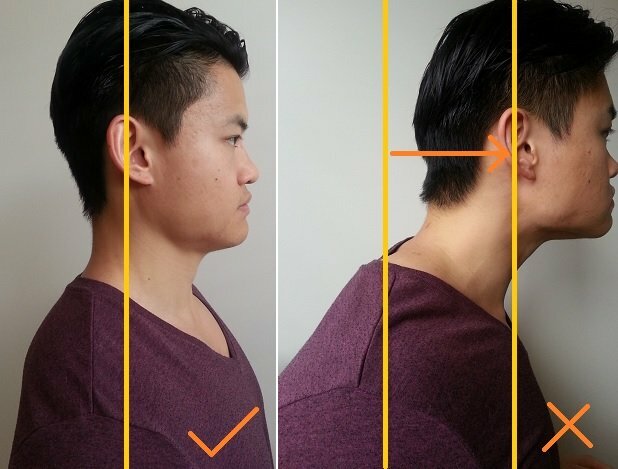 I have recommended this site to others over the past year of trying to fix my own posture. I am in currently in a precarious situation with my rolled shoulders and forward head posture. After doing these exercises for about 2 weeks I had a ton of daily relief followed by a breakthrough. I would do them prior to the gym 3 days weekly and 10 days ago while doing incline bench press when I heard some “good crackling” followed by a crunching sound and then an ahhhhh as my left shoulder and entire left side of my back moved into proper position. The right shoulder moved some, but did not release. So now my shoulder is higher and forward on my right side while my left is in a position it hasn’t been in for years. The result is a 1/2 success. My the right side back is extremely tight from top to bottom with soreness under my scapula and in the lower back and getting tighter daily. The exercises that were working for me relied on using both sides to pull on each other and I can’t get the same tension now due to imbalance. Much of the muscle tension left that I can’t get to let go is in the right pec and the right upper trap. 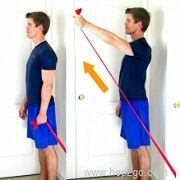 I’m rolling the trap against the wall and continuing the exercises that provide some relief daily with no results. If I could get the right shoulder to do the same I can’t imagine how much more comfortable I’d be and on my way to good posture for the first time in my life. It feels like it needs to be both simultaneously relaxed while having force exerted on it to “pop” back into place. Do you have any suggestions on how this could be accomplished either at home or with gym equipment or do you expect that continuing with the current program will provide results eventually? It sounds like you just need to continue with the current program. If it worked for the left, it should also work for the right. These areas can influence the position of your shoulders. Thanks for the great and comprehensive article. Is there a minimal set of releases/shoulder stretches/shoulder mobilization/shoulder strengthening that would be most effective? ex. if I had to pick only 4-5 exercises/stretches to do on this page, what would you recommend? I would recommend trying all of them first, and over time, see which exercises your body responds to the most. The general rule is that the longer you have had your postural issues, the more difficult it is going to be to address. But – Don’t let this discourage you. There are always exceptions to the rule, and at very least, you will be preventing the posture from getting worse. There are several muscles that run between the shoulder and elbow. But if I were to guess, you are talking about the biceps? Thanks Mark for responding. I do have to say that after completing 2 full routines that I don’t feel as tight in my upper body. The area of pain in my left arm is the bicep area. It hurts when I did the lying down test, putting on a seatbelt, sometimes reaching over to apply lotion to my right arm and a few other situations. Do you think your routine will loosen up this area and eventually the pain will fade? Thanks again! It might be a good idea to get an ultrasound to have a look at your biceps tendon. These exercises will help with your rounded shoulders, but not specifically a biceps issue. First of all thanks for helping people. This has been the most helpful article that I have read by far! I have been struggling on the timing and frequency of these types of exercises, as I lift weights MWF and do cardio/abs on the off days. When do you recommend that I do this routine perhaps in the off-weight days? Is there any benefit to doing it three times per week? Thanks! Yes – that works fine. You can even squeeze some rehab exercise in between your weight sets. I’m a bodybuilder who works 40 hours a week in front of a computer, and also a PC gamer in my free time at home. When hitting bodybuilding poses, its obvious, based on looks, I have some sort of impingement and posture issues going on on my right site. My right shoulder hangs lower and is more foreward, my right pec appears tighter and bound up, and I struggle to completely flare out my right lat. I’m going to start incorporating these stretches/exercises into my routine to see if they help with my symmetry, thank you! I don’t have a .pdf summary. But I should make one! I had triple heart bypass surgery nine months ago, recently when seeing my primary doctor she told me to sit up straight, I had no idea that my shoulders were leaning downward. I can recall being in so much pain (still have lots) that I held my chest downward. Do you think that these exercises would help me or do I need to see some type of specialist? Thank you by the way, I took a chance and googled “how to straighten shoulders” and clicked on your web site. I am upset right now and feel hopeless with my PT. So I have this right scapular, right shoulder pain, right neck pain. I was told my right shoulder is rotated forward..Went to PT 3x already. We haven’t done stretching, just strengthening exercises. And man it hurts worse doing it and I’m getting worse and I have a flight or fight response, very irritated.. So I thought maybe it is my lats? So I decided to youtube lat stretch exercises and omg pain is gone by 80% and I feel less scapular impingement. Is this normal for PT more strengthening vs. stretching exercises, it doesn’t make sense to me. I feel most of my pain has been relieved by help on the internet. Every PT treats and prescribes exercises differently. Strengthening (as well as stretching) have their place in your rehab. Some people may require to focus on one more so than the other depending on their situation. The lats are a strong muscle that tend to make your posture slouch and shoulders round forwards. You did a great job researching it yourself! My recommendation is to discuss your finding with your PT and see what else they can come up with. Amazing article man, this is the best guide I have read soo far! Hi Mark, just found your site. I’ve had shoulder impingement on the right side for about 3 months now. I believe I injured it while doing lateral raises. Healing has been up and down and I now think rounded shoulders is to blame. I’ve purchased an AlignMed posture shirt and will continue doing PT and following your exercises. Thoughts? How to fix Shoulder Impingement. this post has really inspired me. I have spent 4 hours working through it. You recommend spending 20-30 mins on the exercises. Should I do a selection of them rather than trying to do them all? If so, should I try a few from each section, or start with the first section? You can pick a few exercises and just start working on them. However – you might need to do focus on stretching/releases more in the beginning to help make your strengthening exercises more effective. Thanks for this great article. It seems to be exactly my problem. I was wondering, do you know if the rounded shoulders and bad posture can also cause TMJ and jaw pain? Thank you! Rounded shoulders can be one factor that may be leading to TMJ issues. I would also point out that a Forward head posture would be another major factor that may contribute to your jaw pain. Great f***ing article, seriously. F***ing phenomenal. This needs to be result #1 when anything related to “anterior capsule” is searched. I knew a lot, and was on the right track with many of the prone shoulder retraction exercises/progressions but you have clarified some things for me as well as introduced me to a few new variations. Thank you and keep moving forward with your passion. I love this comment. Thanks for taking the time for writing it. I struggle with neck pain to the right side for almost 10 years. And I discovered it probably comes from my shoulder. I notice the right shoulder is rounded forward. So I tried the exercises for rounded shoulders, but every time when I use strength with my right shoulder, all the muscles get tight again. Then I need to do a lot of release work to loosen up. When I release my back and shoulder, the pain on the back of my neck subsides. But then the front feels tight, including the scm muscle. So I seem to be zig zagging in tension between the front and the back. Then I discovered overhead movements really tighten my shoulder all and around, even downward dog seems to mesh with my shoulder. So I figured doing the scapular winging exercises will help to strengthen my serratos anterior to facilitate a scapular posterior tilt. This seems to work, but my pec minor very tight. If I succeed in fully releasing and stretching the pec minor, the neck pain can be completely gone. But it slowly returns. And even faster when I use protraction force, for example in planking. I focus on down and around the rib cage, but the pec minor tightens so fast. It is like I have to start all over again. I wonder if I am on the right path and if I should continue the cycles to strengthening and releasing the shoulder? Strangely enough my left shoulder is very strong and I never have to stretch or release anything on the left. Hi, I’m a massage therapist and constantly see this problem in my clients. I educate them as to the likely causes and give them advice and tips on how to address the causes, but getting them to undo their bad habits & do the necessary work on themselves is the most difficult! They just want someone to “fix” them, preferably in one 30 min massage session!!! Anyway, your article is really good, I like the mix of info, diagrams and exercises, would you mind if I shared it on to my Facebook page? It may just appeal to some of my clients more than me trying to get the message home! I went to a PT and he told me similar information as what you have here, except he wanted me to strengthen my serratus while in this post you say it should be stretched out? Just wondering if you could clarify what the correct course of action would be for me moving forward. If you have shoulder blades which sit quite laterally on your rib cage (common in rounded shoulders and rounded upper backs), then you will likely have TIGHT serratus anterior. In this case I would say stretch it. If your serratus anterior is weak AND you have rounded shoulders, you can still strengthen them in a shoulder neutral position. It’s awesome and very generous of you too offer so much advice for free and take the time to respond to so many people in need of help. I just wanted to mention that the stretch you have illustrated for the anterior delt, whereby you place your hands on the chair and let your body weight stretch the front shoulders, is not really ideal for people with tight pecs, particularly tight pec minor. This stretch will further tighten the pec minor. Also the angel mobility excercise is extremely difficult, and often impossible to do correctly if you already have rolled shoulders, and problems will arise such as tightness in corresponding muscles. You want to keep your scapula in a retracted/depressed/posterior tilted state as you perform the stretch. This will prevent the forward dumping of the scapula and thus tightening of the pec minor. 1. I have self-diagnosed myself as having rounded shoulders and winged-scapula along with pain between my shoulder blades. Would this mean that I need to go through the routines for all these conditions (of course excluding repititive exercises) ? 2. Being a beginner, the pain on all my tender points cannot of course go away after only a few sessions with the massage ball. I understand that I can still continue with the rest of the session after the massage-release part even though the tenderness pesrsists. Am I right ? 3. The lateral side stretch and the front shoulder stretch cannot be maintained for the specified time because of weakness in muscles needed in supporting the stretch. 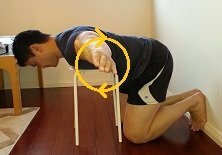 Should I continue to hold the stretches until muscle failure ? 4. Can the sessions be divided into different days ? For example doing the releases and streches on one day, and mobilization and strengthening on the next day ? 5. How should I continue my gym workouts ? Would it be advisable to hold off all upper body exercises for now, since I’m not sure which of the exercises aggravate my condition ? 2. The massage ball release should help reduce the tension in these muscles. If it hurts too much that it hinders your strengthening exercises, I would tone the pressure you place on the massage ball. You’re looking for a firm (but comfortable) pressure. 3. I encourage my patients to hold their stretches as long as they can! It you can’t hold the side stretch for very long, you can try these exercises (but position the body so that you are getting your lats). 5. Try to continue with your gym work and become more sensitive to your shoulder positions whilst you work out. A chest workout can become an exercise for rounded shoulders if you maintain a good position of your shoulders throughout the movement. I have a question. Whenever i try to correct my posture, i feel a kind of tightness in my right arm, it becomes a bit numb and it seems to be blood flow becomes restricted on that part. What does that mean? This can happen from time to time. More often than not – it is coming from the neck. Sometimes the nerves in the neck can get pinched when you change the position of your shoulders. Do this: When you correct your posture, I want you to look down and tilt your head slightly to the left side. Do you still get the same symptoms? I have a lot of questions and I also feel like I need to include a lot of details with my problems. I have hip problems to fix with my right foot rotating out, but my biggest problem is my shoulder. I just can’t get my left shoulder into proper position for any upper body exercise. It honestly feels like my front delt is stuck to my chest. 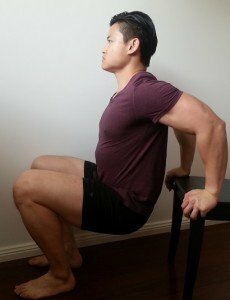 Is it that until I fix my pelvis, I won’t have the shoulder mobility I need? Can I have hip problems, but still get my shoulder working? I’ve made a lot of improvements through massage therapy and Chiropractic adjustments, but I still feel like after sleeping on my side, sitting in a weird driver’s seat and not stretching while bodybuilding for several years has made some serious issues. I definitely have tight muscles, but I’ve been stretching and all that, it’s just that sometimes I feel like I need to snap my shoulder back into place like how broken noses are. It also crackles a lot when I roll it forward and back. Hopefully there’s at least something that you could help me with. I really appreciate you reading my comment and thank you for the article! If you have done every exercise you can think of for the shoulder, the next area would be the torso. Some people can be rotated and/or tilted in this area which may lead to shoulder and hip problems. Has the chiro checked this out for you? First of all, thank you for this. It’s obvious that you care about helping people and giving them the tools they need to fix their issues. My question is in regards to how much of a factor would you consider larger breasts to be in having rounded shoulders. I have very large breasts and rounded shoulders, do you think I can fix my rounded shoulders without a breast reduction? Thank you again for your time, expertise, and reply! Larger breasts means there is more weight at the front of your chest. More weight at the front will pull your shoulders forward and down. Breast reduction may help reduce this front weight, however, getting stronger postural muscles that can handle the weight is a better way of tackling this issue. Can you recommend one or two strength training / weight pulling to help with rounded shoulders ? I go to gym often, and I heard Face-Pulls and Rows are good ways to strengthen the back muscles and help correct rounded shoulders. I would like to ask a question, please. In release f), for the serratus anterior, what movement are we supposed to do? The upward arrow has me a bit confused. Also, is that supposed to be a firm or soft foam cylinder? Could I use a rolled-up towel instead? Hey Mark! Thanks for the very detailed post on something troubling many of us. What is the difference between releasing and stretching? What is the purpose of both? And how do we assess the progress/success we are having with each? They essentially are doing the same thing. We are trying to reduce the tone of the muscles that are pulling the shoulders forward. Releases are great for those who can’t “feel” the stretch over the full muscle. my left shoulder is rolled forward and my left side is rotated forward. The left scapula is also in a different position than the other scapula. I tried a lot but i am rather unsure and getting despair. Do you have any Ideas how i can get rid of it? If you feel like you’ve done many exercises for the shoulder and still having issues, I would encourage you to have a look at your pelvis. Check out this post: Rotated pelvis. I also have a blog post about rotations in the spine coming out soon which may help you out as well. First thanks for the post its great to get information like this. However, ive been trying this for a over a month and my shoulder is still painful and rounded. My question is i have done this along with continuing to workout. My left chest is very tight and i have done many releases but it wont fix and i only train my back and legs now as my posture isnt improving. I also get neck pain on my left side too – do you think this is related – tight levator scap and SCM. Any advice or ideas on where to research on where i might be going wrong. Also due to rounded shoulders, i cant get very good back activation, so this could be tightening up other muscles? If you feel that you have done every exercise on the shoulder and still no progress, I would look at other areas of the body that might be leading to your shoulder issues. The next area I would check is your thoracic spine. Do you have a curved upper back? If you do , check out this post: Hunchback posture. Hi Mark…Thanks a lot for such a detailed information on this problem…I am 39 rt now n having rounded shoulders since my teenage or may be must be having it before that…but never took it seriously was unaware of it as a medical issue…So it’s almost more than 20-25 years…I m having upper back ache n very frequent neck pain…so is it possible to cure it after so long…?N what should I do to avoid further complications…Thanks once again for such a good post..
You can definitely fix the issues that you have mentioned. The same exercises that will help fix the issue will also help prevent it from getting worse. Let him walk and play without shoes (as long as it is safe) on different ground textures. This will encourage the foot/toe muscles to strengthen which in turn may help with the flat feet. You can do exercises with him: How to fix flat feet. But.. as he is 6 years old, you may find some difficulty with compliance. I wanted to thank you for this blog because it really seems like a good solution to fixing rounded shoulders. I’ve been just wondering my whole life there was a bone at the end of my shoulder bone sticking out of my shoulder like it is above the whole shoulder. When i searched something like that i’ve come across a phrase called “separated shoulder”and it says that it is received from some kind of injury. A trainer at my local gym said that i should just add more mass to it. I did and it stayed the same.So i’ve been wondering if you could give me some tips on how to move that sticking bone to the place where it should be because it looks really weird seeing me shirtless or within shirt. Thank you in advance! Are you referring to the AC joint separation? I’ve been reading about the rib flare and hunched shoulders. Due to years of IBS I have a very bad posture and pain in the back. I have a hard time contracting my stomach correctly throughout the day. I can do it properly during exercise, but throughout the day I lose “power” as though my stomach muscles get exhausted – not to mention that a lot of the time I am too bloated to pull them in. Do I start with the ribs? The hunched shoulders? The stomach? Abdominal issues can cause your whole posture to stoop forwards so addressing this area FIRST is very important. Hello Mark! thank you so much, This is very usefull for me 😀 Greetings from Italy. When I straighten out my hunched shoulders, for example when I do that move you recommend for placing the shoulders in the correct posture, my lower back arches and I feel like it is impossible to maintain a neutral lower back and straight shoulders simultaneosly. Why? This sounds like you may have a tight thoracic kyphosis. Check out this post: Hunchback posture. Hi Mark thanks before sharing you’re knowledge, the excercise were extremely helpful, but I have a few questions. 1, So the pain I’m getting was diagnosed as shoulder impingement, I have a dull pain from very deep in the centre of my left shoulder, I went to a physio and he said I had rounded shoulders and my pecs are pulling on a certain muscle and it’s impinging.. so I was wondering, how long does it take to improve my posture using these sort of excercise so my shoulder will be sort of painless and I can go back to wieght lifting, as I’ve lost a lot of wieght and have been off the gym for several months? Thanks! My second is how hard is this injury to get rid of off… I’ve heard horror stories of it taking years…or months and months, if that’s so I will probs just go back to the gym pain or no pain aha! In terms of how long, it’s really hard to answer! Everyone is different. However- in regards to your gym work, I would do as many shoulder exercises as you can that does not hurt. I have a post on this. I think it might help : Shoulder impingement. I’ve just done your exercises for the first time and feel such a release in my shoulders and neck area. Thank you so much for taking the time to post these. I am going to have a better day because I began the day with these exercises. Absolutely looking forward to doing them again. Glad to hear there is relief from the exercises. Hi, great site. I have bean bodybuilding for a couple of years and have developed scapula winging, I have pain in my shoulder while sleeping. I have always had problems with rounded shoulders but am overcoming it with a lot of my physiotherapists suggestions. Can you tell me if there are any gym exercises which may help my scapula winging, so I can fit them into my back workout. I sit at a desk all day and am working on my posture while I work, I am also thinking of purchasing a standing desk, is this a good idea. All gym exercises can help your scapula winging if you can engage your serratus anterior muscles properly. Check it: How to fix Winged scapula. I have rounded shoulders and an anterior pelvic tilt which I am working on fixing. I notice that when I perform chest stretches on a foam roller my mid delts tend to get sore. Should the middle deltoid muscle be stretched or strengthened? You shouldn’t get any soreness in the middle deltoids when doing the chest stretch unless you are experiencing some shoulder impingement. Try to keep your shoulder blades retracted, depressed and posteriorly tilted ( “pull shoulders back and down) before doing the stretch and see how that works. If the deltoid pain continues, do not push the stretch too deeply. I have a bit rounded shoulders and also some scapula winging on the right side. The front side of my right shoulder hurts when I get in the upper position of a scapula pull. What can I do to fix this? Do you the think it is the bicep tendon that hurts? Hi, first of all thank you for this post, as there are a lot of great exercises. My pain is on the front of the right shoulder, as the rotated shoulder is brushing against a tendon and inflating it. I’ve had this problem before and with about 30 sessions of phisiotherapy it got better, but now it’s hurting again. Are this exercises still adequate for me? Thanks! These exercises will be a great place to start. However- it does sound like you may need to strengthen whatever tendon/s that is injured in the first place as well. My right shoulder started hurting over a year ago. I have been told it’s shoulder impingement. I’ve had 3 cortisone injections and am on my third round of physical therapy sessions (Kaiser only gave me 6 at a time prior to the injections). An MRI showed a tiny year in my supraspinatus, but the therapist thinks it’s just age and wear and tear vs the source of my pain. I do not want surgery. It’s been over a year. I ice it, take Advil, and have even worn a sling. I’m trying to be diligent with exercises. I have decent mobility and strength, but I’m still in pain and it’s definitely not healed is there any hope for a full recovery? What do I need to do to facilitate healing? I will do anything to get better and avoid surgery. If the supraspinatus is the source of your pain, I would do specific exercises to strengthen that muscle. I have rounded shoulders and am working hard to improve my posture. I do sleep on my side. Should I stop? Do you recommend people sleep on their backs? However… once you fall asleep, you can’t really stop yourself from moving into a different position. Side sleeping is what I call Horizontal slouching, so it can be a factor leading to your rounded shoulders. You may just need to increase your stretches and exercises if you can’t change your sleeping posture. The post is really comprehensive. Thanks for your advice! Hello, thanks for all the good info. I’m going to try the exercises you recommend to fix rounded shoulders, forward head posture, and thoracic kyphosis. I was wondering, is there a particular kind or brand of massage balls you could suggest. I have spent a lot of time on the Walmart website and I’m unsure about which one (s) to choose. Once again, thanks for the amazing website. Just get a simple Lacrosse massage ball. Hey Mark, this was very helpful. Thank you. Thanks for taking the time to write me this comment. I LOVE IT. Thank u for the great website! I am a pathologist and spent 25 years sitting all day looking in a microscope. I go to vigorous yoga 3-4 times a week to try to strengthen my upper back. It only hurts when I walk or stand for over an hour or so but this is severely limiting my hiking and other activities. The pain is most often at the tips and between my shoulder blades. It is a burning pain that is immediately relieved by sitting or bending over. Can u suggest a specific set of exercises in your large repertoire that would help? I am sooooo frustrated cause thought the yoga would fix it – my classes r for advanced yoga practitioners and I do feel stronger but this back thing still bothers me. A set of like 5-6 exercises to target that specific area would b great. Thank u!! Are you talking about the region between the shoulder blades? If so – check out this post: Shoulder blade pain. Please excuse me if you have already answered this question, there are a lot of posts to sort through. I have Hyperlordosis and rounded shoulders. Your fix is to strengthen the correct muscles to fix the problem, but I am curious about your thoughts about a neoprene material back brace that straightens the spine and pulls the shoulders back. Not to use it continuously, just for a few hours a day. Thank you for your input. My general rule regarding braces is to use it for the least amount of time as possible whilst still getting some benefit from it. Essentially – you do not want to develop a dependency on it to fix your posture. However – that being said, if a posture brace helps serve as a reminder to keep better alignment, then it is fine to use. Aim to wean off the amount of time you use it over the next few weeks. 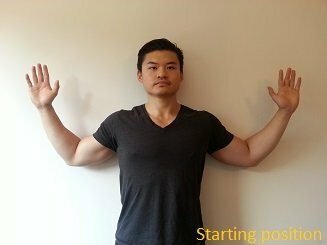 Would you mind making a pdf of this exercise series similar to the Forward Head Posture Correction post? Thank you for writing these articles, the exercises are helping. I will do it when I can! Hi Mark, I am Anshuman. I think i have lordosis problem. Will it be possible to make it correct?. But you would be on the wrong blog post for that. Hi Mark, started doing all of that today. I just have 3 questions. 1) You mentioned that tight biceps also contribute to this posture, yet you did not mention any stretches for biceps? 2) When I rolled out my lats today, I felt a strange pain in my shoulder…. is this ok? Pain faded immediately after releasing contact of lats with the foam roller. 3) Should I keep working out muscles that are ‘tight’? For example am I able to continue benching, or doing pullups etc., as they target the chest, shoulders and lats? 1) Biceps stretches are good to do! I should add them as well. 2) Chances are you hit a tight spot. However -if in doubt, just go a bit lighter and slowly ease into the muscular tissue. 3) You can continue with your normal work out. Just make sure you perform the exercises with your shoulders in a more neutral position. Hey mark, thanks for the tips. Their working but I have 1 question! 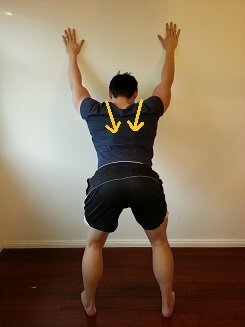 While doing wall angles and get close to the “Y” position I hear and feel a popping in my right upperback between the scapula and spine, I should mention my right side is the more severe effected side with a weaker shoulder and less mobility (my dominant side) any idea what it could be and o prevent it?? It may be your taut fibres in the muscles between the shoulder blades which is common in rounded shoulders. Focus on ball releases to the area to help reduce this. Would say doing this exercise together with the scapular winging exercises affect improvement in rounded shoulder and scapular winging? Or for gentle exercises like this even if it involves two opposing muscles, after we do the initial stretching, we should be able to target both area at the same time. Although these exercises are more specifically for shoulder blade winging, it may also help with the position of a rounded shoulder. I am a little confused about the role the Serratus Anterior plays in the faulty rounded forward shoulder posture. In on part of your post ( in the picture with an X illustrating weak and tight muscles) it lists the Serratus as being weak. 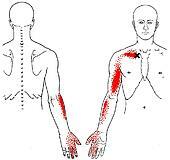 Later in the text it says the Serratus is tight and pulling the shoulder blades forward. So is the muscle both tight and weak? Should the serratus anterior be strengthened, stretched or both? I know the action of the serratus anterior is protraction of the scapula and assists in scapular motion for overhead lifts. Please clarify. Thanks. In rounded shoulders where the scapula is protracted, it is common to find the serratus in a shortened position. Prolonged bouts of this position will make the serratus anterior quite tight which in turn, will cause the shoulders to round even more. Tight muscles do not always mean that they are strong. Many muscles involved in postural distortions are tight and weak at the same time. To answer your question, you can strengthen and stretch the serratus anterior. Why stretch? If these muscles are locked tight and pulling your shoulder blade forward, you will want to stretch/release them. Why strengthen? As you have mentioned, the serratus anterior plays a huge roll in over head lifts, but it also needs to be in balance with the other muscles around the shoulder blade that are responsible for stabilising the scapula in the ideal resting position. Strengthening these muscles from a neutral shoulder position is great for shoulder health and posture. Hi Mark, for past 3 months I am suffering from pain at the lowest back of my head after working on computer. Thinking that it is due to lack of excercise I started doing some stretches and within 2 days the pain had worsened. Also, I felt difficulty in holding my head up. Now if I try to turn my neck sideways I feel like something is pulling between my neck and shoulder. I have a very bad situation. I saw many doctors but my condition is also worsened. Also I feel a clicking sound for my left jaw when I try to open my mouth. How can I fix theses issue. Please help me. Hi Mark , I am 47 year old male from India and quite impressed by your informative post. Would be grateful.if you could guide me here. I am physically quite active and was into gyms , jogs ,spinning etc almost daily till christmas of 2017 when my right shoulder symptoms (re)surfaced. 3. My X ray shows loss of curvature in the neck . 6. 4 years ago I had an injury during a funride at my lower left part of scapula of the right shoulder. I had experienced similar symptoms then and it healed in 3 months with treatment and physiotherapy. After that , it keeps coming and going every year . And I feel like some ‘knot’ at the point where I had that injury. Please guide me about this and how to solve this problem permanently. My right shoulder is rolled forward more than my left, and I also have more muscle volume on my left side than my right (mostly visible in the chest). Could my right side be weaker because that shoulder is more rolled forward than my left? If so, should I do these stretches and excersizes the same amount on both sides, or more on the shoulder that’s worse? And is there anything else should do to fix the imbalanced muscle? These exercises for rounded shoulders are a good place to start. It may just be a matter on focusing on the side that is more forward. HOWEVER- other postural issues can lead to one shoulder more forward such as a rotated torso and/or pelvis. My problem is that I feel like only one of my shoulders is hunched forward. I studied and used my laptop without a table for a couple of years and that forward leaning towards one side destroyed my right shoulder and my back. I can feel/see that my right shoulder (anterior and posterior), right traps, and right upper back have less muscle and strength than the left one. Also, it is very difficult for me to do anything that involves heavy lifting or great mobility with my right shoulder or back. I tried going to the gym and I could feel that my right back/shoulder was weaker than the left. More importantly, whenever I tried doing rows or some bar pulling exercises, my right shoulder/back would feel very awkward and I think I could not involve any muscles there and was doing all the work with my left side. At this point, I want to tell you that I have weak back muscles but my right part is basically bone and skin at this point, and I feel like I can’t engage the muscles at this point. Is there anything I can do, apart from the aforementioned exercises, to fix this? Should I stick to there exercises first or do you recommend going to the gym and doing some dumbbell exercises to fix the right side? Thank you. Your help is tremendously appreciated. Sounds like you got some imbalance between your left and right sides. Commonly – this can be found in people with rotated/tilted spines. Unfortunately for now, I don’t have any posts specifically on these issues. Soon though! If you left shoulder is forward (and there are no other major postural deviations), then I would check the pec minor muscle. This muscle pull the shoulder girdle down and forward which may make it difficult for the upper traps to activate from this position. Any advice as to how to sleep if you get shoulder blade pain? I’ve been having chronic shoulder pain in my right shoulder blade. I’m also most comfortable sleeping on my right side which I think probably isn’t best for my shoulder. If you are comfortable and it doesn’t make it worse, you can sleep on the right side. For more info on sleeping position, be sure to check out this post. The exercises in the blog post are a great place to start to help you with your Rounded shoulders. Bench press and gym workout is wrong for correction rounded shoulder?? It is fine to keep bench pressing. Just make sure you are placing your shoulders in a neutral position FIRST before you bench. can i stop my gym workout and start jogging?? Really great post, thanks for taking the rind to put it together. I have had various problem with the left side of my neck / right hip and only now do I see a lot of these problems come from my rounded shoulders. Any tips / pointers you can give regarding sleeping on your side? My posture at my desk is easier control but I know I really curl my shoulders in when I’m sleeping. Sleeping posture is a tough one. You can start in a good position, but who knows how we move around we are asleep? I like to encourage people to sleep on their back as this promotes the most symmetry of the body. You can still sleep on the side, but I would recommend use pillows to help support your body. Check out this post: Best sleeping position. is there anything you can recommend during the 8hrs or so sitting behind a desk. I get up and stretch and walk around. My shoulders def. curl forward and I carry alot of tension in my upper shoulders and neck. I m seeing an acupuncturist it helps but when he does manual massage he says the shoulders are both extremely tight and it aches but afterwards helps. How can I do my part while at work. I catch myself sitting straight up but leaning forward towards my computer all the time. On top of doing the exercises, you can try postural taping such as the one below. It will help remind to maintain a better position. Interesting! What kind of tape is that? Thanks! I’ll try it. And thank you for the great exercises. Helps already after only one day. It really depends what it causing your shoulder height discrepancy. It could be your shoulder blade could be uneven heights or even your torso might be tilting to one side. Your neck is probably trying to compensate for something that is happening further down in your body. Although I find that the sights you gave me are not proving any visual difference but your ’rounded shoulders’ sight is seeming to help. I think I’ll just stick to that. My son had the same thing. I took him to an orthospinologist (cervical chiropractor) and discovered his atlas was rotated and tilted, so the rest of his body was being affected. After his first adjustment, his body came back into alignment. He also suffered migraines for years from the forward neck and tilt of his neck. He looks and feels great now. Please search for “orthospinology doctors near me.” Don’t waste time and money on any other type chiropractor. I know from my own experience. I sincerely hope you get the help you need. I am looking forward to applying your suggested technics to correct my rounded shoulders although I was wondering if I should skip the anterior shoulder stretch if the movement is very awkward on my articulations. (Some minor pain and quite uncomfortable feeling in the articulation of my shoulders, as if they could dislocate)…Same discomfort with an external shoulder rotation with my arm held horizontally. Also, I have practiced and understood the isolation of the scapular squeeze movement and included a rubber band to work my rotator muscles. Unless I focus a lot, it is hard to prevent my sternum (chest) going up. Is this a compensation to the movement? If so, is there a trick to prevent it (I have an arched back, figured it could be my weak abdominal muscles responsible for this). If it is painful, feel free to leave it for now. But – you might want to further investigate as to WHY it feels very awkward in the first place. You may have limited range of motion in that plane. You are correct when it is likely weak abdominal muscles that is probably causing your sternum to rise (aka rib flare). Check out this post to help you out on this issue. Thank you for the blog, I will be adding these on my daily work out routine, would you also suggest and dumbbell exercise for stronger trap and rotator cuffs ? That is fine to do . Hi Mark, great post. I have rounded shoulders as well and plan to do these exercises 2-3 times per week. Is it OK to supplement these exercise with a normal push/pull workout routine on the other days of the week? Or will the other workout hinder the progress from the rounded shoulder fix routine? It is perfectly fine to do your normal work out routine on top of these exercises. Just make sure you keep your shoulders in that neutral zone. It all started with my hand feeling weak and stiff, went to the doctor turned out to be a pinched nerve in my neck. I don’t know if it was the right diagnosis because i had no MRI done, so the doctor just assumed. That freaked me out, so I started to panic, thought something was terribly wrong with me so lo that gave me more anxiety. Etc. that actually made my pin worse and stared to develop aches and pains all over my body mostly( upper back, lower back tightness, tight hamstrings, calves, adducturs won’t relax they’re just contracting. Every time I try to start exercising again I wake up the next morning with more aches and pains but feels like my muscles just tightened up even more. It’s like a cycle, the more I worry about my symptoms the worse it gets. I went to the chiropractor and they said I had a reversed curve on my neck due to bad posture thoroughout the years, but my disc still look healthy. Could this be causing all my symptoms? I have had rounded shoulders for quite some time- and have always had moderate back pain up to some degree. I am very active. Throughout high school, I did competitive cheer leading(hurt my back more), as well as cross country and track. Currently in college and still running competitively and I read recently that rounded shoulders while running creates even more problems. I do have shoulder pain while running sometimes and collarbone pain (not sure if that relates-I did break my top rib back in high school years ago). I also suffer with scoliosis- a double curve. Not enough to have needed surgery but enough to cause enough pain. This also causes me to have a higher hip (and tilted pelvis), as well as lowered arches. I saw in one of your replies how the pelvis position can cause rounded shoulders. What should I focus on treating first? I know I need to fix multiple things/imbalances. I also go to the gym frequently and am trying to focus on strengthening my upper back and shoulder muscles. I’m thinking I should try at least doing your rounded shoulder exercises before going to the gym. Thanks for reading all this and for your reply! Since you have pain at the back/shoulder region, I would say start with the exercises mentioned in this post. The exercises should help with your pain as well! But ultimately, you will need to address the other remaining postural deviations. I currently do not have a scoliosis blog post yet, but here is one for your lateral pelvic tilt. I am 18 and I have had a stiff neck (that pops a lot) and some tightness in shoulders for around 2 years which started due to a stressful time. At first I used to get an annoying feeling in the upper back that i could not pinpoint to a specific region and it would stay throughout the day. I started stretching at home which has improved the situation, however whenever I go through a prolonged period of working hard and having to use the laptop I get uncomfortable and tighter than usual. I think I have slightly rounded shoulders and that is causing tightness in the neck muscles especially the points at the base of the neck (I don’t seem to have a markedly forward neck), which is aggravated by poor seating at the laptop and weakness of back muscles. I have a normal range of motion of the neck, but when I am stretching and looking up or to the side, I feel discomfort and tightness of the muscles at the base of the neck connecting to the shoulders. So, I want to soon start weightlifting while supervised by a professional (and targeting my pull, not push muscles), while continuing my stretches to strengthen my back muscles significantly. Does this seem safe? Because I have so far tried to rely on stretching and aerobic exercise and that has only gotten me so far. I feel like weightlifting and building and strengthening muscle would help support my neck and free my shoulders. hello sir make a video channel youtbe and strip for science and explain us how to do posterior time backward tilt etc and now to engage serratus anterior and lower traps etc….. I have rounded shoulders, the forward neck problema and lordosis (no need for surgery and I can hide it if I stand up straight but definitely I have this problems). I’d like to know… which problem should I attack first? Which one should be the top priority. Your content is amazing and I’d love to start right away. In regards to where to start? It goes back to the question of which came first… the chicken or the egg? I like to start with the area where these is pain. With this way, you should see some immediate effects of the exercises. Ps. Don’t get too caught up on which one to prioritize. Just start! Thank you for your quick response! It’s great to have this material available for free thanks to you. I’ll follow our advice and start asap. I just came across your blog and am feeling a little more hopeful that I, myself, can fix my problems. I have been to countless physiotherapists over the last 26 months and all it has resulted in is money down the drain and no change in pain. – right anterior hip posture, over active deep pelvic and external hip rotators complicated by glut max, medius tendinopathy and inhibition of these muscles. – compensatory stffness and right rotation of right low lumbar spine with poor deep muscle activity. If possible and applicable, could you please list name (no details needed, I will do the research) exercises that will help with the above? My quality of life has been dramatically and negatively impacted which in turn is straining my family. With no avail from physiotherapists and I have been seeing “the best”, supposedly, I am thinking of finding myself a personal trainer and providing them with a list of exercised to ensure that I am doing them correctly. I am more than willing to train everyday and multiple times if need be. Your thoughts and expertise would be greatly appreciated and it really is selfless of you to take the time to share your expertise. I wish you the very best and wish I was a local! I look forward to your reply and sincerely hope that you can offer me some guidance and further hope. Probably best to message me on Facebook for this specific help. I am having hard times hitting my lats in gym, I think it is caused by rounded shoulders. Is it possible? And should I continue on my training programm? Actually I am focusing on upper/lower traps and skipping chest and front delts. – Lower the weight so that you can focus on contracting your lats. – Think about pulling the weight with your elbows and not so much the hands. – Pull more so with a bias towards your pinky finger. – Perform a lat spread as you do lat exercises. – Keep your shoulders in a neutral position. Hi Mark! I think I have rounded shoulders and I tried out that thing to “quickly re-set the position of your shoulders.” I didn’t even hold it for so long and the veins on my right arm started to pop out a lot and I could feel it. What’s wrong? Or is it that bad? One thing that immediately pops into my head is something called Thoracic outlet syndrome. This is where your blood vessels/nerves can get a bit squashed in the shoulder/neck region when you lift your arm up. Hi mark,i have problem with my back.i had brace when i was 17 and i use it for a year,but nothing changes. now i have a vary bad posture in my back !i have rounded shoulder and i have khyphosis too.i want to start swimming (butterfly) and after that i want to playing tennis (3 times a week) for about 9 months.does kt make any chane?are those exercises good?when i use this exercises i will be good for rest of my life?or if i quit problems will get back?! I am not a huge fan of posture braces that are used over a long period of time. These exercise performed consistently will help out with your Rounded shoulders issue. In regards to your thoracic kyphosis, check out this post here. ihave problem by my back a lot ! when i was 17 use brace for a year but it doesnt make any big change in my position!now im 22 year old and my back looks like badly and i am so sad for this problem!you know?! i thing i have a round shoulder but not havine a kyphosis because when i make my shoulder back my position in the back gets right!but i dont know how to diffrentiate between kyphosis and rounded shuder?can you help me in this ? i have seen in the internet that khyposis cant change in old but rounded shoulder can cure,is it right? if i want to exercise in 9 months (3 times a week) does it cure for all of my life or it will be good when im exercising?! i want start my swimming and im going to learning butterfly in swimming does good for my psture? I workout rigorously at the gym with heavy weights. 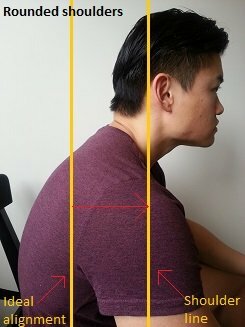 So is it possible it is hampering my posture (rounded shoulder) much? Although you may be getting stronger, you are likely getting stronger in your wrong posture. Try to prioritize these exercises first. Keep a neutral posture as possible whilst training. And if you are not progressing, definitely go see a physio. Just about to start these exercises. Thank you for taking the time to create this resource. I have a quick question – how many and which type of massage ball will I need? Looks like two plain and two spiky – do they come in different sizes? They are like less than 3 dollars or something! The spikey and smooth balls do essentially the same thing. I prefer the smooth texture though as it allows you to apply a lot more pressure through to the muscle. Excellent – I will get one today! You can try out these exercises out first for a couple of weeks and see how you go. If in doubt or if there is a lack of improvement, you can go see a physiotherapist. Great stuff not sure how to post or where ( old person)Joke. I don’t trust all Dr’s is this something as bad as is sounds and can i do some of your exercise to fix this? You are the person I trust for honest answers. Having a tear (as shown in your scans) does not always correlate with the presence of symptoms. It sounds like it is a degenerative tear as there has been no trauma. At this point, the best thing would be to treat is conservatively. – Optimizing posture and movement. Also – Check out this post: Shoulder impingement. If your rounded shoulder is due to weak/tight muscles, then these exercises will help fix that for sure. But be aware, other postural factors such as torso/pelvic position can influence the shoulder position as well. the Dr does not seem concerned he said exercises and PT can solve this. First, thank you for taking the time to write this guide. I’ve been dealing with a very stubborn and tight upper trap which gave me lots of neck tension and has caused my right shoulder to be rolled forward much more than the left. On bad days it almost felt like the humerus was ready to come out of the shoulder joint and burst out of the anterior delt (not really but that was just the sensation). After having done only one session I’ve noticed immediate improvement in both posture and in the reduction of neck and trap tension. I should also add that through research and an exam from physio the cause of this has been weakened/under active lower trap, which has been compounded by ‘improper’ bench pressing for many months now. Would you recommend that I continue this routine? I certainly wont take this as ‘medical advice’. These exercises should be able to help you out. If it was due to improper technique on bench, I would focus on releasing the pec major, pec minor, subclavius and maybe even lats in particular. I have been suffering from neck pains (mostly sides and back of the neck) and upper back pains for many months already. I evaluated myself using the guide you provided, and it seems that I may have slightly rounded shoulders as well. I was actually told by my doctor that my C6 and C7 is fused and that I have “loss of cervical lordosis”. Is there a permanent treatment for all this..? Please advise. If your C6/7 is indeed and undoubtedly 100% fused, there is not too much we can do about that. However – I find that many people just have “tight” C6/7 and with repeated and consisted exercises, you can get some movement in there. I would recommend reading this post here on how to get it moving again. Dumbbell upper body work is fine. Just make sure you focus on maintaining a neutral shoulder position and you’ll be fine. As long as we’re doing the mobility and stretching, could we just do proper form Rows and rear delts exercises to help as opposed to the exercises you suggested? I am 17 and i have anterior shoulder pain during chest workouts and pushups espacially during benchpress. I have pain around my scapular reigon too. Will these stretches and excersises help me . I am suffering from 5 months . They might help place your shoulders in a better position. You will need to identify which ones and strengthen them to begin with. I’m 16 and I’m not sure if my shoulders are properly rounded but I know they’re constantly slouched and I always forget to push them into the right position. Are you saying that if I do these exercises at least twice a week, I won’t have to think about it when I’m studying or writing and that they will straighten themselves without me having to consciously make an effort to push them back? That is the exact goal with these exercises. You probably have an imbalance of muscles in your posture leading to a) your shoulders being pulled forward and b) weak/inactive muscles that are not bringing your shoulders back into a neutral position. Once you correct this imbalance, the shoulders should sit nicely without conscious effort 100% of the time. Hi Mark! thanks for your blog. My case is a little complicated: I have had shoulder disclocation for many years (maybe 30 or more times when I was young), then I’m training in the gym and my muscles are strong. But I can’t work my back properly because I can’t contract well back’s muscles, also my shoulders are falling forward. What do you think I need to do? Thanks so much! With shoulder dislocations, you want to strengthen the shoulder in the position where it is weak. In most people, this would be in the 90/90 position of the arm. Once you have strength and stability, you can do these exercises for your Rounded shoulders. Once your shoulders are in a more neutral position, it will be easier to engage your back muscles. The common mistake when training back is that people actually are working out their biceps instead due to the lack of contraction of the back. In what order am I meant to do these? Do I start with releases or do I do all 4 sub sections (strengthening, releases etc) in my daily session? I’ve suffered with this all of my life, I think due to stooping because I’m tall. Do I pick a few exercises to do each time or do I do all of the ones on this page? Are releases also considered exercises or are they something I’m meant to do after the other exercises? If you have the time and if it is practical for you, try to do them all in the suggested order. If not – start off with just the releases and stretches and take it from there. The golden rule in regards to frequency is… Do it as many time as you can! Think about how long you have had your posture and the amount of sitting in front of a computer. … Now think about how much time you spend on postural exercises. You want to bridge that gap as much as you practically can. This is great info it appears the doing internal and external rotation exersizes daily is key to helping being able to lift my right arm over my head. Can I do these with light weights laying on the floor everyday? You can do those said exercises too! If you are still growing, bad posture generally gets worse! I would recommend addressing your posture now so that it doesn’t become a significant problem in the future. All the best with the exercises! Hey Great advice here, really felt better after doing these. I was wondering can I do the releases, stretch exercise or shoulder mobilisation daily? Thanks! Glad to hear you felt some benefit from the exercises. Great thanks! Lastly about the strengthening exercises whats the most days you would recommend me doing these a week? Everyday, Every other day, as much as you can! But if you wanted a rough guideline, at least 1-2/ week. I am so glad I found this page! I truly believe this will help my ongoing problem. I’ve been in so much pain for so long. Doctors and physical therapists don’t know how to help (or they don’t care enough). Thank you! I’m looking forward to being free of pain. In External Rotation in Supine, there’s a towel under the guys elbow in one shot and under his head in another. I don’t really feel the stretch so I know I’m doing something wrong. Where should I put the towel? Thanks! If you can not feel any stretch, you may not be tight in this particular position (which is a good thing). If this is the case, you can skip this exercise and move onto the next one. This posterior tilt position with shoulder blades, should we try to maintian it throughout the day, e.g. when walking, or just when doing these exercises? Yes – you should try to maintain it throughout the day. … But just make sure you aren’t stiffening your whole body whilst you do it! 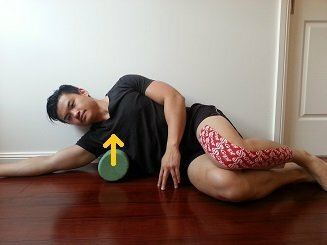 regarding exercise 1. releases: a) Pec major/minor, can I use the wall so i can lean on it and roll the ball instead of the floor as I find myself hard to move on the floor as there’s a huge friction so it’s hard to move up and down (on the wall i don’t have friction except with the ball)? Do what ever suits you. Hi i am body builder beffor 6 month i start to have right shoulder problem aka tendinitis/bursitis.My question is can this be becouse my chest was verry big and powerfull versus my upper back.I Was doing 6 x exsercise per week for chest and only 2 for back.Will this prorgram above fix my problem? These exercises will help bring back the balance between your muscles. Make sure you are placing your shoulders in a neutral position when you are doing chest. No short cuts I’m afraid! Thanks so much for your site. My issue is the top of my shoulder blade angles towards my shoulder socket and the bottom part is closer to my spine. 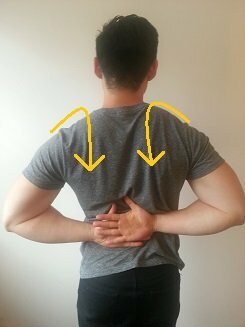 What exercises could help me get my scapula back into the correct position? It sounds like you have what we call a medially rotated scapula. Check out this post for anterior pelvic tilt. Once you can control your pelvis, you can practise squats, deadlifts, lunges etc in neutral pelvis. 1. What should I do for muscles … Is it normal? 2. How long would it take to strengthen my back and shoulders as I can’t really do any exercises for my rounded shoulders or neck because of it. With these exercises, do what you can do. If you can only do 4 or 5 reps. That is fine. Everyone has to start somewhere. The main thing is to progress from where you start. Your body has its limits. If you go excessively past your limits, your body will likely hurt. Do as much as the body will comfortably allow you to. With repeated and consistent effort, the body will adapt and the exercises will get easier. If Rounded shoulders is the main cause of your issues, then these exercises will definitely help. How long will it take? I have not assessed your personally so I can’t really answer. Even if I did, it would still be a stab in the dark. Thanks for this article. I have had very rounded shoulders since I was little girl (I think due to poor body confidence, I am now in my thirties) and have never corrected them. I saw a photo of myself recently from the side and was shocked how poor my posture looked and the impact this had on my body shape. I am determined to improve my posture but realise I’m having to correct a lifetime of incorrect habits. Any tips for how I can ensure I constantly pull back my shoulders without reverting to my normal poor position and are back braces/corrector worth considering? Thanks. You are going to have to keep catching yourself when you let your shoulders roll forward. The first step is always awareness. You won’t be able to keep good posture for majority of the time to begin with (and that’s completely normal). I am not a huge fan of braces as it makes your postural muscles lazy. But they might be useful in the beginning if you keep forgetting about your Rounded shoulder. Thanks Mark, this is a great website, thanks for sharing all your knowledge! Thanks for the great write up! I’m trying to determine if I have rolled shoulders. When I let my shoulders relax on my side, my palms did not face me (aka cave man look). However when I stick my thumbs out, it doesnt stick out completely straight. Instead it points out diagonally. Would this classify as an intermediate case of rolled shoulders? I also noticed when I lie straight on the floor, my rear shoulder dont touch the ground. Are inverted rows and pullups good exercises besides the ones you mentioned in this article? Sounds like you do have a degree of Rounded shoulders. Inverted rows and pulls up are great for strengthening the back muscles to help pull the shoulders back. Just make sure you can feel the muscles working in the back, and not so much in your biceps. My shoulder blades barely move together when trying to get the retraction/posterior tilt. Is this normal or is there something I’m missing. I also have a winged scapula for both shoulders, could this be an issue? Posterior tilting a very subtle movement. If the inferior border (the red bits) are sticking out in your back, then it is likely the scapula is in a position of anterior tilt. It depends on many factors. Eg. Severity, how long you have had it, what you do for work/leisure/exercise, age, etc. Try to aim for ongoing progressions over a long period of time. Cracking is usually a sign of a release in pressure of the joints. This probably means your joints are being compressed together in your posture. When you first start doing the exercises, it is common to get some cracking. As your joints and posture as a whole improve, this should stop. Hi Mark! Thanks for this. I have rounded shoulders and forward head posture. Do you how much estimated time is needed to correct this if done regularly. Thanks in advance. Your work is awesome, thanks for sharing freely your knowledge. You rock man! How necessary are the releases? I don’t have any massage balls that I can use but I have been trying to use tennis balls instead but I don’t think they are working as much as I would hope, so if the releases are not done properly would that mean I don’t get the results? Thanks in advance. If your muscles aren’t tight or over active, then you can skip the releases. However – if they are, they are very important! Tennis ball may not be firm enough to get the right amount of pressure on the muscles. To reduce the kyphosis, have a look at this post: How to fix Hunchback posture. All of those exercises mentioned there are specifically designed to address your upper back curve. You can continue your weighted exercises and cardio as long as they are not encouraging your back to curve more. If i do only some of the exercises,will it still have any impact?With only light exercises such as hanging from horizontal bar and other stretching exercises problem in my left shoulder got better. But in right shoulder ,problem persists. I use my right arm for fast bowling in cricket? Also while working on round shoulders,I felt stretch mostly in left shoulder and mostly pain in right shoulder. Doing some exercises are better than doing nothing at all! It just depends on what your body requires. Thank you for sharing your expertise! Are releases, stretches, mobilizations and strengthening exercises supposed to be all done in one session and every session? Or should a person work on releases for a week or two, then stretches for a few weeks and so forth? I would start by doing all of them in the one go to begin with. But it really depends on how much time you can allocate to doing your exercises. If you can only do a small amount each day, then that is fine too. I know there are a lot of exercises and it can be quite time consuming, but compare this to the amount of time that you are probably sitting/standing all day! Hey mark your comments have inspired me to ask a question. I get told by friends and family I worry too much! After going to see pysio therapist I was told I had bad posture possibly from spending long hours on game console as a teen. Iv been given some exercises to do now and the pain in my back has eased off on my last pysio appointment I was told my posture is getting better, However sometimes after I do the exercises and more so if I don’t do them I get a stabbing pain above my left pec and underneath my collar Bone. Is this normal because I worry about Angina and heart problems as there in my family. I’m 32 and this worry is ruining my life Iv had ecg and nothing shows up doctors think I’m crazy about heart problems and shouldn’t worry so much. I do tend to stress out a lot and that’s what makes me think about Angina. I would appreciate it if you could shed some light on this situation. As heart issues is outside my expertise, I can’t really comment that. These muscles tend to get tight with a bad slouching posture. The exercises in the post should help with that. Try to be aware of what exactly causes your left chest pain. If it is arm movements or sustained postures, it is more likely a muscular/joint issues. If it starts to get worse with stress, increase heart rate, cardiovascular training etc, I would definitely go back to the doctor to get re-assessed. I’m currently having physiotherapy for a shoulder impingement, which has made no difference after three months and I came across your blog when looking for solutions for rounded shoulders, which I know I have. The exercises I’ve tried show that my pec region is excessively tight and the muscles at the rear are weak – despite the physio exercises I do every day. The question I’d like to ask is: If doing the postural exercises hurts my shoulder because of the impingement, should I continue with the exercises in the hope that the eventual better posture will alleviate the impingement, or will doing the exercises aggravate the impingement? Although your rounded shoulders has likely contributed to your impingement, you will need to address the shoulder locally first. This should involve reducing inflammation (eg. anti-inflam medication, anti-inflam gel, cortisone injection), rest from aggravating activities, maintaining pain-free range of motion and isometric strengthening. Try to avoid any activity or exercise that increases your pain. You can try some of the exercises mentioned here as well. Thanks for the help! I have been looking for good articles ti correct forward head and rounded shoulders. I have bad posture since im 12 (probably) and now I am 25. My question is, can I avoid looking stiff when walking while maintaining the proper posture? When walking, a good way to maintain good posture is to imagine you are being pulled upwards by your head. The aim of this is to elongate your spine. When you think about to many components of posture, you end up stiff as a plank of wood. Another question, will push ups help? My bmi is 17.23, could it be one of the factors im too underweight is that im slouching? Just wondering. Push ups are good for posture IF you maintain neutral spine/shoulder/head whilst performing. Otherwise – if done incorrectly, it could encourage the bad posture. I find being over weight usually will affect posture more than being underweight. And im also wondering what posture problem you had, as it was in your About Me. That would be motivating to know. – forward and hitched left shoulder. So I was the first! I suggest that you make a post on how you corrected your posture, since it might be that most of us who are so far from correcting our own posture may find it hopeless. That, my friend, is a great idea! Hi Mark – thanks for the exercises! I also have spinal nerve paralysis caused by lower jaw replacement surgery, which has caused the forward rotation of my left shoulder. My question is, if I do the above exercises, and the muscles involved are not firing (according to the NCS), will the exercises benefit me? You can see a prominent difference in my neck and shoulder area. I have great trap muscles on my right side, but the left side is absent. Any suggestions? Do you know which specific nerve/s was affected? This will determine how far you can these exercises. Even so – The exercises will still likely benefit you. You may just need to rely on your other muscles which are not affected by the nerve paralysis to pull your shoulder back. Hey Mark, great article and thanks for keeping up on replies to everyone. I have rounded shoulders and they aren’t very severe. I’m a track cyclist and don’t frequently lift my upper body like I used to for football. I’m also not having pain. My issue is this: When I’m in the gym doing traditional bicep curls (my only other exercises are squat, single-leg deadlift, leg extension, hamstring curls, leg press, and pushups) I cannot get a squeeze/contraction of my bicep at the top of a curl. If I do a curl with my elbow pointing towards 2-3 O’clock, I can get a little bit of a squeeze but still not a normal squeeze like my left. 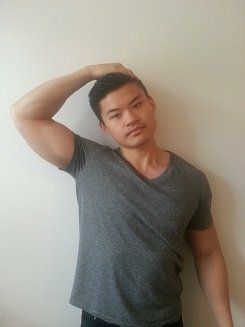 I know your post says that over-active or tight biceps could cause rounded shoulders, but I don’t lift enough to really say that my biceps are too tight or over-active. Could rounded shoulders cause my inability to fire the bicep at the top of a curl? You can try supinating your arm at the top of your bicep curl. Think about your pinky finger twisting upwards and out to the side. This will help recruit more of your biceps muscle. If that doesn’t help, you can try either reducing the weight or use single arm biceps curls. If that still doesn’t help, check your elbow range of motion to make sure you have full elbow flexion/supination. Without full flexion/supination, you won’t be able to get that full contraction of the biceps. And then if all those options don’t work, it could be that your posture (possibly rounded shoulders) is placing your biceps in an effective position where it can not contract completely. Hi Mark. 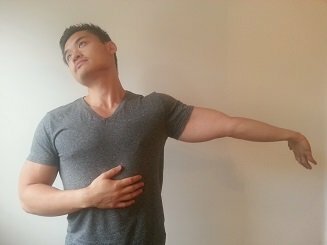 I’ve been doing these exercises for a while on and off, and I always had this problem that I can’t feel a stretch in my chest while doing the doorway stretch, I only feel it in the front of the shoulders, and it feels like I’m just wasting my time. I’ve watched quite a lot of videos on different techniques of stretching the pecs and the only one that feels even remotely successful is laying vertically on a foam roller, however, even then the stretch is minimal in the pec area. So my question is: is it normal not to feel a stretch in the chest area? and what can i do about it if not? Make sure you keep your lower rib cage down when doing the chest stretches. Sometimes to lower back can compensate. Another way you can stretch is to do the same door frame stretch but in a push up position. I’ve had terrible muscle spasms in my neck but, with PT, I do have relief. I do have a rounded back from slouching (I do sleep on my side due to a laminectomy years ago) and I am doing PY exercises to improve my posture. How can I tell if I have neck bones/joints that have become fused? I also have tingling in my legs especially my right leg. Any info or recommendations you can offer would be greatly appreciated. If you persist with these exercises over a long period of time (and providing you are doing them with the correct technique and intensity) and see absolutely no improvement at all, then it may be suggestive that your joints are fused. Tingling in the Right leg will usually mean some sort of nerve is being irritated. Have you had any scans to rule out any disc issues? HI MARK! I VE FOUND YOUR BLOG GREAT! I LL DO THESE EXCERCISES …WILL A SPINAL BRACE HELP CORRECTING ROUNDED SHOULDERS? IF SO, WHICH ONE YOU RECCOMEND? I am not a big fan of braces… purely because people generally get reliant on them which tends to make your postural muscles lazy. I have Supraspinatus impingement and am wondering if the rounded shoulder exercises (I have bad posture) will help cure the Supraspinatus impingement? Rounded shoulders can predispose you to poor shoulder mechanics. This in turn can lead to your supraspinatus impingement. Hi. Nice article. I have Rounded shoulders. I am going to gym regularly now. Are there any exercises I should avoid if I have Rounded shoulders ?? For example, if my chest muscles are tight, should I do chest press ? It is fine to continue with chest work providing that you are doing it with the proper posture. Just make sure you keep your chest work in balance with the opposing back muscles. Hi, how do I know which problem I have?! I think round shoulders, but my back goes in at the bottom too, so I’m like an S shape? My feet also turn inwards, is there anything I can do for those too. I’m a right mess posture wise, I’d love to be ‘normal’ like other people, I hate the way I look. If your “back goes in”, you may have a hyperlordosis. This may related to an anterior pelvic tilt. Knees going inwards is called knee valgus. Cheers for the comment, Sam. Lift as heavy as you can with good technique and posture. I am currently doing exercises 3-5 times a day, throughout a day at even intervals. Will I still be able to make progress if I do this around work, but not during work hours (9-5)? Yes – that will still be okay. Try to maintain as good posture throughout the day, take frequent breaks and continue your exercises. I am a french guy living in china, I used to sit and play videos games a lot ( sitting front of my computer for hours). Its kind of hard for me to find an physiotherapist here. I find your advises very helpful and would like to thanks you a lot for those instructions. Do you have anything for winged scapula and anterior pelvic tilt? I will share your website to other people, please keep it up, amazing instructions. Hey Mark! How do I know if my muscle are tight and what is the cause of muscle tightness? After I “release” the muscle will it get tight every time I go to the gym and lift weights? A muscle is tight if it prevents you from having full uncompensated movement. Eg. A tight pec minor will prevent you from bringing your shoulders backwards without arching your back. If your gym is making your muscles tighter, you will have to make sure you have proper technique and train all muscle groups equally. Hey Mark! I’d like to thank you for all of these answers and I have one more. 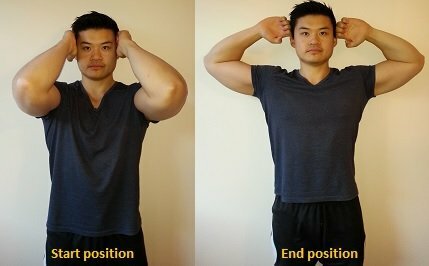 After I’ve “fixed” my rounded shoulders when I completely loose my shoulders and try to hold a neutral position will they still lean foward or down? Thank you! The shoulders should sit in a neutral resting position. If they still poke forward, you will need to keep working on the exercises. Hello thank you for a lot of helpful information. I would like u to ask when stretching ur hands back bent 90 degrees and palm facing outside my shoulder blades cause pain when pressed softly. How do i cure that? Check out this post. It goes through how to address your shoulder blade pain. Thank you Mark. It really helped in identification of my problem. I am working towards all the steps you mentioned. Last thing i wanted to ask is i m a regular gym goes i lift very heavy weights, in these recovery days how much should i go maximum upto or is there any problem in full body (all muscle group) working out at gym? It is fine to continue your gym work. Just make sure you are not doing them with rounded shoulders. Hey Mark! Will these exercises work without releasing? I would also like to thank you for this amazing article! Thanks for all of these questions. If your muscles are not tight, then you do not need to release the muscles. It may just be a case of strengthening/engaging your postural muscles. Hello Mark, how often can I do these exercises? Can I do them daily or should I have one rest day in between? Also, can I use a tennis ball instead of the spiky ball? Also will gym chest, shoulder and back weight exercises help with fixing my rounded shoulders? Thank you. Do the exercises as many times as you can. 1/day would be a minimum. If you require a rest day, you can also do that. Tennis ball is fine to help with the releases. However- I find a lacrosse massage ball provides the best results. Gym exercises are great, however, many people do the gym exercises in the wrong posture. You need to make sure that your maintain as neutral posture as possible in all exercises. 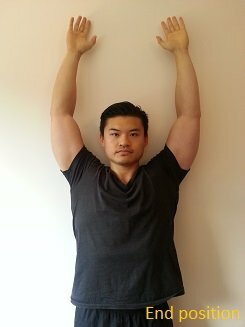 Should I do these exercises every day and how long should it take for my rounded shoulders to get fixed? Will they be fixed in a way where I can rest and they will look normal or will I still have to pull them back? Yes – you should do them every day. 1/day would be a minimum. In terms of how long it will take…. it’s really hard to say. Some people can correct it straight away as all that was wrong was a lack of awareness of shoulder position. Whereas others have to release tight structures and strengthen weak muscles FIRST, which can take weeks to months. The goal is to have your shoulders NATURALLY sit in the right position without you having to jam them backwards. My pain is in upper arms just below shoulder when laying on them , right side is worse than left probably because the right is my preferred side to lay on . I feel like my shoulders are scrunching forward which creates pain around collar bone area . What excercise would help to allievate my pain which results in lots of lost sleep . ? Is the pain around these areas? Thank you for this article Mark. I do alot of lifting at work and always thought I was to bulky in the shoulder area. My sister just recently brought my rounded shoulders to my attention. I’ve noticed in the past that when I lay with my chest flat on the floor I look as if I have a slight hump on my back. I was also diagnosed with a RT shoulder impingement and have been experiencing RT rib pain for a while now. I am going to try the exercises to strengthen my muscles and hopeful this will help. Please let me know if you need any help with your shoulder impingement. Asymmetry in the abdominal muscles can either be genetic or some sort of poor alignment of the pelvis into the ribs. (and/or vice versa). This is a great post idea that I can do in the future. Hi Mark! Thanks a lot for this great article which I luckily happened to stumble over. I have noticed that there is some scapula winging when I do push ups, and read online that I should then strengthen the serratus anterior to correct that. At the same time I have rounded shoulders all the time, and if I understand correct you recommend to stretch the serratus anterior for that; not strengthening it. I’m confused as of what to do, when it seems like the excercices for scapula winging and rounded shoulders contradict each other ( if I am to believe what the other sites said). I believe yours makes most sense though. Please help me! If you have both Rounded shoulders and Winged scapula, you will still want to strengthen/learn to control the Serratus anterior muscle in both lengthened and shortened positions. I would try to fix the winging before you fix the Rounding of the shoulders. Mate thank you SO much for posting this. I have had stiffness and pain in my upper back from overworking my chest and not working other parts creating a muscle imbalance (too much bench press tightening up my chest coupled with a tendency to roll my shoulders forward). This has helped me SO much, all of the massage ball techniques brought immediate relief. Awesome to hear! I used to fall into the trap of over doing chest (…and biceps !) too. Great articles. I really need some help and have a couple questions. I suffer from winged scapula (due to inhibited rhomboids, lower/mid trap and serratus anterior, not nerve damage). I also suffer from anterior pelvic tilt and rounded shoulders. I am currently following your other articles on anterior pelvic tilt and rounded shoulders. My anterior pelvic tilt seems to have been partially caused by squatting, the lower back has become very strong, and also the muscles on the side of the lower back are actually arched as they are so big, creating an indent in the middle of my back even when it is straight ( this is nothing to do with the spine it is just that the muscles on the side of my lower back protrude as they are overdeveloped). Do I need to take anything extra into account when correct my APT in terms of what I have explained has caused it? Furthermore, could you give me some advice on winged scapula, and strengthening the lower and mid trapezius? For winged scapula, a good place to start with is to get your serratus anterior engaging to help flatten the border of your scapula on you rib cage. Check out the PushUp Plus exercise. For lower traps, I personally like to do scapula depression/retractions whilst on the lat pull down machine. In regards to your APT: If you have over developed muscles in the lower back which is tilting your pelvis forward, you will need to a) focus on relaxing/stretching those muscles and b) making sure your glute and abdominal wall are able to bring you to neutral pelvis. Also – make sure your hips and torso are rising at the same time in the ascend portion of your squat to make sure your lower back is not over working. Very informative post! For the past 6 months, I have not been able to do chest day due to shoulder impingement on my left side (bursitis, bone spur, tendinitis, osteoarthritis, etc). I am on 500mg naproxen, have been doing physio, and it’s a lot better than it was but I’m by now means cured. As you pointed out, rounded shoulders and weaker lower back muscles are culprits (my physio worker says my left scapula “slides” abnormally when raising my arm). The main catalyst, however, was working out with a broken pinky (it was snapped in a splint as I was benching 80lb dumbbells… Hindsight knows how ignorant I was — I didn’t know then). Do you think surgery is required if I’ve hit half a year with impingement? I usually find Shoulder Impingement a result of a combination of poor posture, weak/tight/inhibited muscles and poor movement strategies. By identifying what exactly is preventing your shoulder from moving properly, you can probably avoid surgery. What kind of rehab exercises have you done? Also you can check out this post on Shoulder Impingement. It may help out a bit! Hi Mark, quick question. I have rounded shoulders and forward head posture. I am unable to lift both my arms, at the same time, to make the letter T. It feels as if I’m lifting a lot of weight but there is no weight. Maybe something in my shoulders is locking up. Could my rounded shoulders have something to do with that? Thanks. Rounded shoulders can place your shoulder blade in a position where it will make it difficult for you to lift you arms >90 degrees. Have you had a look at this shoulder impingement post? This may be a good place to start if you are experiencing pain. It doesn’t hurt at all when I lift my arms, they just feel heavy to where I can’t lift them. It’s more uncomfort than pain. I have a 12 Year old son who has rounded shoulders. Would these exercises work for him? They will help with your son. Also – with young children, try to encourage them not to slouch whilst using the smart phone/tablet. Hi Mark- is it necessary to do these exercises in order as you have them listed, and all at the same time? Or can you do them throughout the day, as you have time? You do not have to do them in order. I would much prefer you do whatever you can, whenever you can, rather do none at all! Hello i have a question for you. The aim of these exercises is to get your body to naturally hold you in right posture. Good posture needs to become natural for you, rather than forced. As your muscles are probably still tight, it is going to be very uncomfortable (and require a lot of effort) to keep them back and down. It gets easier! I promise you! Thank you for this article. It’s really help a lot! Could you give me a tips for sleeping posture so I won’t have rounded shoulders again? Thank you so much. I always advise to sleep on your back as this is the best sleeping position for your posture. Check this post out for more info on sleeping position. It is pretty much impossible to keep your shoulders back whilst sleep on your side. I have an anterior pelvic tilt, forward shoulders (only when standing/sitting) and a forward head posterior plus flat feet. I have been getting quite intense right occipital headaches, which initially only occurred during exercise which push ups but now are basically daily. Which problem would address first? Can send some postural pictures to you for advice? If you are getting symptoms in your head, then I would start with your forward head posture. With your push ups, you need to make sure that you are not pushing your chin forward. Keep your neck completely relaxed. Feel free to send me postural pictures through the facebook page. You can click here to go straight to the page. Hi, mark. I’m now 24-year-old, male, 185 cm with rounded shoulder. Thanks for your clear info. I was wondering how should balance the rounded shoulder fixing & muscle training? You can continue to train your chest, as long as you are doing it with good posture. Hi Mark, I have problems with kyphosis, forward head posture, anterior pelvic tilt, I’m unable to lie on my back to do any exercises as all the muscles tighten up within a matter of minutes and cause terrible pain/spasms, (I did try Pilates classes for a year but gave up in the end as my back pain didn’t improve) i’ve recently been to an osteopath and she says my muscles are constantly working to try to keep me upright when they should relax. I also tried massage I went about 20 times but she said my back is like concrete and she can’t get the muscles to relax at all, please help. It does sound like your upper back is locked into flexion (Kyphosis). This will automatically force your lower/middle back muscles to work over time. Check out this post to help with your rounded back posture. You will need to make sure that each position is comfortable. Do not force the position. Thanks Mark, is there anything the massage therapist can do to help relax my muscles or do I need to correct my kyphosis first? Get them to release all the muscles mentioned in the post. HI Mark. First thanks for information, I’m looking about this for long time. But I have some questions, I have a ROUNDED SHOULDERS and FORWARD HEAD. Should I fix which one first or fix it together and if I do not have any of gadget like a ball will be okay ? Thank you so much for reply me. A massage ball helps heaps. But if you can’t get one, anything that can apply comfortable pressure to the tight areas may work as well. Hi mark thanks for the article.. i also have round shoulders.. and i am going to gym so is it ok to do bench pressing and pectoral strengthening exercises having round shoulders? If not then should i continue going to gym ? Great article, thank you for such great info! I’m 39 and started running about 3 years ago, since then my shoulders always feel tense/tight…even when I’m in bed and activley trying to relax my body. I am starting weight training next week and will utilize a lot of the exercises you presented, but I was hoping you might have a suggestion for sleeping. I have read that you can roll up a towel, put it between the shoulder blades and lay on it at night so that gravity helps your shoulders go back, is this true? 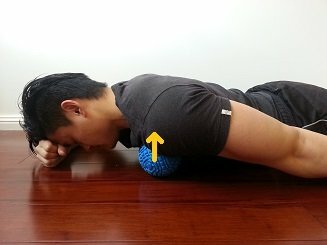 Is there a better way to help my forward shoulders while I sleep? The main thing is do not sleep on your side as this pushes your shoulder forward on the under side. Gravity will usually drop the upper shoulder down and forward as well. I’d say sleep on your back. If your shoulders are quite rounded, support them lightly with a pillow or rolled towel placed underneath the upper arm/back of shoulder region. (… But not too much that it pushes the shoulders forward. If your shoulder comfortably permits you, you could even consider sleeping with you arms up above you. Is there any kind of device or bands you can wear if you work at a computer all day to keep your shoulders back and posture correct? But I would not recommend it. It is better to rely on your muscles to maintain your posture. You could use it short term but never long term. Is there any kind of band or something you can wear when you work at a computer all day to help keep your shoulders back and posture correct? What if you have only one shoulder that is noticeably higher and the opposite shoulder rolls forward more. I also have si joint issues. My right side gets locked and left side seems to by hypermobile. So my right shoulder is down and rolled more forward than my left. I am right handed as well. Thanks! It is normal for your shoulder on the dominant side to be slightly lower. For people with a Right shoulder being more forward, the pec minor on the right may be tight. (Of course there are other factors that can cause this but this would require an assessment of your whole posture). Let me know if you want me to have a look at your posture. You can find me on the facebook page. I can’t speak spanish (I think that’s what language that is) but Google translate has been helpful. To help with your neck problem, check out this post here! I have suffered with rounded shoulders for as long as I can remember 36 now.. In recent years I find myself in a very physical job were I am required to do a lot of lifting and work long hours. Its at the stage now were its got that bad that its giving me tension type headaches above my eyes and they are progressing to migraine. I find I am taken medication almost everyday to keep everything at bay. I guess my question is would these exercises repair my shoulders over time. I know it won’t be a quick fix for me. But the amount of time and money I spend getting the knots rubbed out of my back its got to the point now were I will try any thing. Ps great work on the blog I can see you spent a lot of time and energy into making it. And like to say I appreciate it. It is very common for tight muscles and joints to cause headaches/migraines. Fixing your posture will help with this directly. Try not to rely on the pain killers as they are only masking the pain without addressing the route cause of your problems. If you are specifically having headaches, check out this post on Forward Head posture. It will help! Hi Mark, could you quickly scan through this video(https://www.youtube.com/watch?v=lw2oUa5_7oA) and give your opinion on the exercises, maybe it would be beneficial to implement some of them into the routine provided by you? I’m especially interested in the Reverse Flys and the External Rotator Cuff exercises. Those exercises are completely fine to address Rounded Shoulders. Any exercise that encourages your shoulders to go backwards is great! Wow, I’m a mess! Just reading about the Anterior Pelvic Tilt, that’s me too!!! Thank you so much for these informative posts, these issues are not addressed by most GP’s and patients suffer and are probably overmedicated instead of learning the root of their problems! I’ve worked at my computer too many hours a day for years. Though I’ve always been a walker, the extra time spent writing a book the last year has taken a toll. My posture is awful, shouldered rounded (I have a small scoliosis anyway that’s not visible unless on x-ray) and I realize that I’ve begun standing with my knees slightly bent all the time. Seems like the weight of my body is projecting onto the balls of my feet and away from the heel entirely. Problems occasionally with plantar fasciitis and I’m not sure if that has contributed? We have hardwood floors and my feet stay tender, the chiropractor is trying to help me through neuropathy in my feet which seems to be worsening the more I sit! My chiropractor says I have problems in two neck discs and some low back disc degeneration but overall it’s not terrible. He’s urged me to walk EVERY DAY and I’m doing a brisk 30 minutes without pain. I’ll be working through your programs to help overcome the problems all this sitting has caused, any other tips to help with reversing my foot problem particularly? Your foot pain sounds like it may be arising from the Anterior Pelvic tilt. In this posture your body shifts more onto the front of your foot which places more pressure on the plantarfascia, calf and quadriceps area. It also may cause your feet to roll inwards! So – addressing your anterior pelvic tilt should help de load that foot! Another thing you could do is strengthen your muscles underneath your foot. Check out this post here and look for the exercise called “Short foot”. I just want to know that what should i do if there is no rounded shoulder when you sit down and lay on your back but while walking normally it occurs. My shoulder is normal while sitting or lay on my back but there is huge rounded shoulder appears while i am waliking. The same exercises listed above can help you out. If you experience Rounded shoulders only when walking, you will likely need to focus on activating those muscles that pull you back into the right alignment. The posture you maintain whilst you are walking may also need to be addressed. I am unable to perform the angel against the wall on right side. Should I just work in available range? Do what you can to start off with. But make sure you progress with it later down the track. Thank you so much for posting this information about rounded shoulder. I have never understood why I get such severe headaches and back aches. I have seen so many specialists and never once have they mentioned about my shoulders. I have started doing some of these stretches and have also been modifying my work station. I am starting to feel the pain subside. I knew my posture was out but did not realise my shoulders were the main cause. Now that I am aware of this I can work on improving my shoulders and posture. I wish I saw this years ago. Glad that you’ve found some pain relief with these simple exercises. Better late than never, they say! Check out this post too if you would like to fix your head posture. Hey Mark! Thanks for your advise! I have a question: if I perform the scapula retraction my lattimus Doris seems to take over. How can I prevent that from happening? Try to think about bringing your scapula together, as opposed to bringing your arms back. 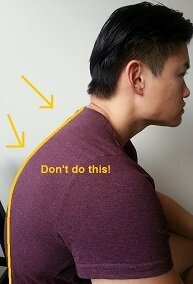 This post has helped me so much with my bad posture. I have a question : you said that we should do that twice a week , can I do that three times a week ? You can do it as many times a week as you like. I would say 2/week is a minimum. More the merrier, I say! Hi Mark, thanks for your great articles. just 2 things. 2. how can a tight post capsule pull the humeros to anterior as you said? The Subscapularis will cause a rolling in of the humeral head when tight/facilitated (Internal rotation), which can see be seen in rounded shoulders. 1. Reduce true Internal rotation in the glenohumeral (shoulder) joint. This may cause the scapula to compensate the movement with an anterior tilt. In this scenario, the whole shoulder girdle tends to pop forward (and to a degree the humeral head). 2. Instead of “pull”, it will “push” the humeral head forward (like a trampoline). I think I have an overly tight posterior capsule. When placing my hands behind my back as per 3.a) and for the “towel stretch” I can’t even get my hand above my buttocks without my scapular winging. I have been doing the sleeper stretch but I’m not sure it’s hitting the tightest muscles. Is there a progression you would be able to recommend in order to improve internal rotation in this scenario? I like doing the sleeper stretch to increase internal rotation of the shoulder joint. You should feel a stretch right at the back corner of the shoulder joint. If you can’t feel a stretch, you might need to gently pull your shoulder blade back and down before crank the forearm down. 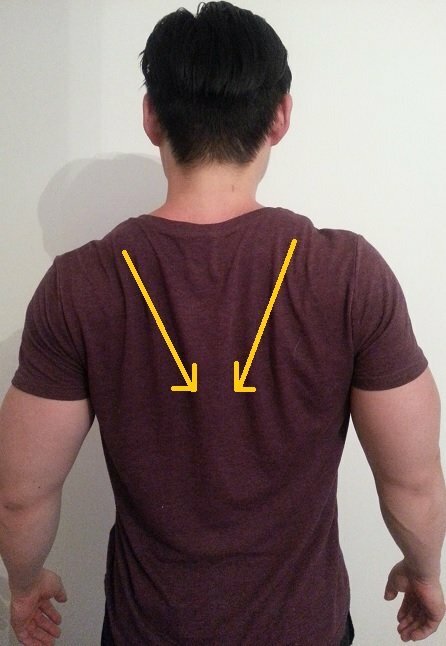 Don’t the lats actually pull the shoulders back and downwards? So why do you put lats at tight, theyre the weak muscles. This can lead to the Rounding of the shoulders. Hi Mark, thank you so much for your wonderful site filled with clear info, illustrations and most of all CARE. I’m a 48 yr old female… very thin, small framed with long limbs. Over time but most particularly in the past few years (had a baby at 41! Yay me! But hard on my body) I’ve experienced a total wreckage of my posture and such an increase in pain… mostly back but neck and knees, too. I just assumed it was because I was aging or arthritis, etc. I found your site and was floored. I have classic swayback posture (booo) that I can fix (yay!). Every exercise I’ve been doing FOR YEARS, has been wrong. So I have made a booklet of sorts with the exercises, stretches etc from your pages for swayback, forward neck, rounded shoulders and I just want to make sure that none of those things conflict. I am getting my @&& kicked by pain so much that I slump, tilt and generally do everything that makes it worse but I have confidence that by Christmas I will feel better thanks to you. It sounds like you are motivated to fix your posture.. And that’s awesome! You can do both exercises for sway back posture and rounded shoulders at the same time 🙂 They do not conflict. Thank you! You are AMAZING… and so quick to reply (again with the amazing). 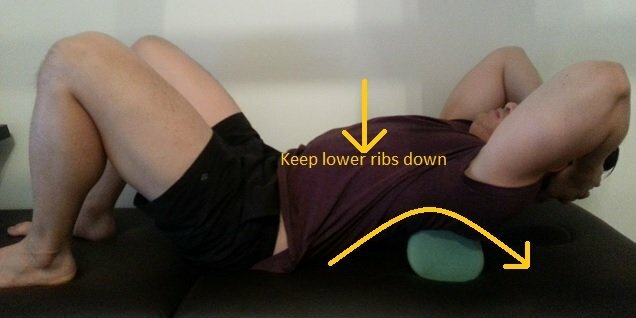 I stood straight with both hands to the very bottom of my abdomen or pelvis and pushed in and a bit up because I seem to tilt downward a little and was surprised to see my whole body change-my knees unlocked and my lower back pain eased, it also made it easier to straighten upper back and shoulders. Ummm, what does that mean muscle wise and pelvic tilt wise? Thanks again! Do you mean you tilted/rotated your pelvis backwards? If this helped with other areas of your body, then it may be due to an anterior pelvic tilt. You can check out this post if you would like more info! What happens if you have rounded shoulders when you sit down but not when you lay on your back? Do both scenarios have to occur or if at least one occurs does that mean you have rounded shoulders? This means you should focus more on strengthening! Hi Mark! thanks for the great informations you provide. my question is it okay if i do further strengthening moves after these exercise?? (for example some kinda of HIIT workout for upper body). i guess my point is is okay at all to do further workout after these exercises? You can most definitely do other exercises in conjunction with these exercises. Just make sure that you are doing your other exercises with good posture. I have forward neck posture, Dowager’s hump and rounded shoulders, shoulder blade pain. Do I need to do all the exercises that you have mentioned in your blogs on these topics ?. They all put together are many number of exercises routine. Kindly let me know. Essentially – I would do them all to begin with. As you become more familiar with the exercises and how you respond to them, you’ll find that you’ll have more of a response to certain exercises than others. You can then focus on those specific ones. Thanks Mark. I get the point.